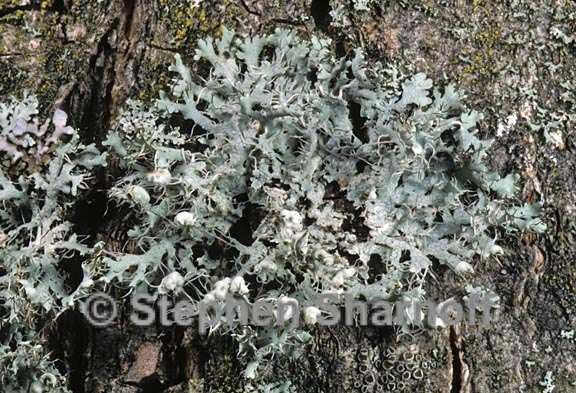 Thallus: foliose, up to 2 cm in diam., mostly irregular with confluent thalli lobes: up to 2 mm broad, usually around 1 mm, about the same in length but sometimes much longer, ciliate; cilia: marginal, pale to black, always black in the outer part upper surface: gray to dark gray; lobe tips mostly much darker, sometimes with a white pruina, sorediate soredia: in helmet-shaped soralia, usually abundant, starting as holes just beneth the lobe tips upper cortex: paraplectenchymatous medulla: white lower cortex: prosoplechymatous lower surface: white to grayish; rhizines: white to black Apothecia: not seen in Sonoran material; elsewhere up to 2 mm diam., stipItate; disc: sometimes thinly pruinose ascospores: brown, 1-septate, Physcia-type, 10-23 x 7-10 µm Pycnidia: sparse, immersed conidia: subcylindrical, 4-6 x 1 µm Spot tests: upper cortex K+ yellow, C-, KC-, P+ yellow; medulla K-, C-, KC-, P- Secondary metabolite: atranorin in upper cortex. Substrate and ecology: growing on trees and branches in fairly open situations, probably introduced by man World distribution: widely distributed in temperate and boreal areas in all continents but more common at higher latitude up to 65ºN and 60ºS Sonoran distribution: relatively frequent in upper montane forests of Arizona and coastal southern California and Baja California. Notes: The species is easy to recognize by the cilia on the lobe margin and the helmet shaped soralia. In the Sonoran Region P. adscendens might be difficult to separate from some phenotypes of Heterodermia erinacea, and it is then necessary to study the upper cortex, which is prosoplectenchymatous in the latter. Physcia adscendens differs from P. tenellula in several aspects. The latter is much smaller and has a different type of soralia and hairs on the upper surface.